Joni has always been creative. Her outlook on life has always been one of awe and passion. Born in Montreal, she grew up in a multilingual household that combined both French and English culture. She started to draw at an early age and continued throughout her life. Joni completed her Bachelor of Arts at Concordia University which included many courses in fine arts. She began oil painting in 2000 and hasn't stopped since. 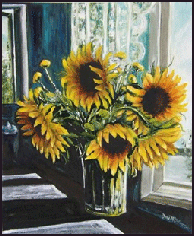 Although her first love is oils she also paints in acrylic and has lately learned watercolor. She has an optimism that can be infectious to those around her. Her free brushstroke seems to tell a story of its own and is her main focus. Unlike many who strive for realism, Joni's love is the paint and its movement. Her paintings reflect a bold brushstroke that thickly applies paint to canvas with abandon. The subject of the painting is real but the paint flows in such a way leaving much to the viewer's imagination. 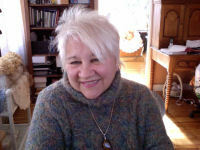 Joni has traveled extensively and lived in many towns in North America. Her return to Quebec and present lifestyle allows her to pursue her painting full time. Ever evolving she has studied with various well known artists and is always involved in further education in art. 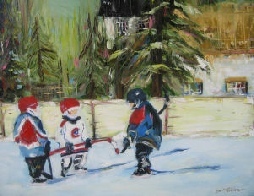 The popularity of Joni's work is evidenced by the fact that her work hangs in many homes in the Hudson and Montreal areas. She has corporate clients and has donated her work to several fund raising benefits such as Nova, Le Nichoir and many local school fundraisers. 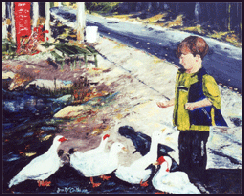 Joni has also exhibited in several juried shows and won a few local competitions. She also does commissioned work. Always looking at life as an adventure her paintings reflect that and the beauty of life around her. Her studio is in her home.